History: Sandman is a cinnamon red boy with white toes and tiny white tip on his tale. He’s tall and lean. His 101-race career was rather wearing on him. His coat will improve and the muzzle marks on his face and the skinned up nose will hopefully heal soon. 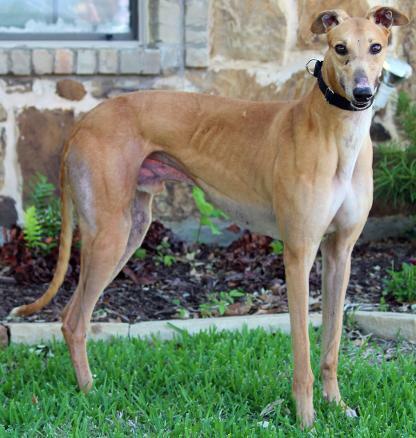 His entire racing career up to Grade A was spent at Gulf Greyhound Park, ending in March, 2014. Sandman and Lacy have the same sire, Lonesome Cry. Sandman has checked out every inch of his new foster home and is now ready for a nap in the air conditioning. 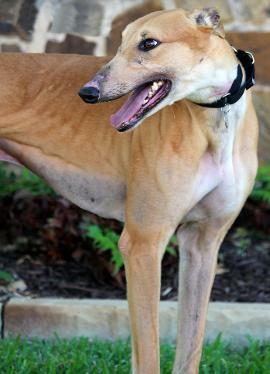 His personality will shine through once he settles in to his new foster home. 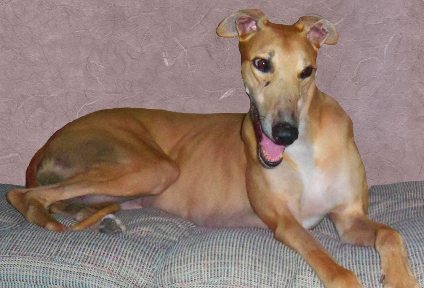 Sandman, now Hotrod Lincoln, went to his forever home with TAGS alumni, Ellie. Congrats to all! 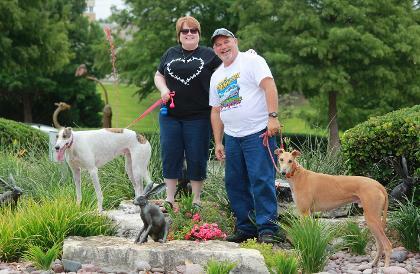 August 30, 2014 update: Sandman, now Hotrod Lincoln, found his lifetime home with his new fur-sister, TAGS alumni, Ellie. Congrats to all. 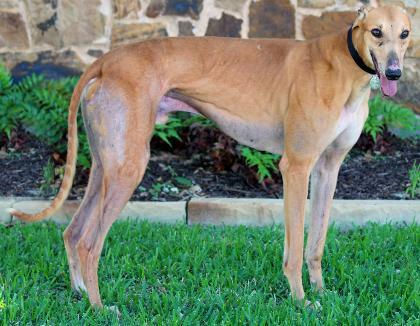 June 5, 2014 update: Foster update: Words to describe Sandman? Gentle, loving, easy, smart, hysterical, and playful. He really enjoys being with his human no matter where he goes although he has begun learning his independence. 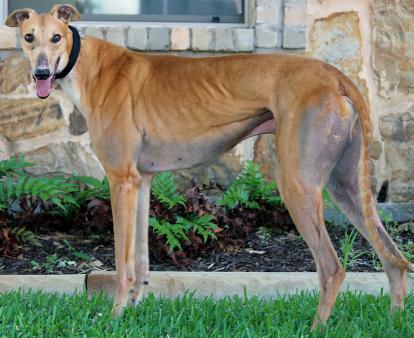 Sandman has had only one “accident” and that was due to his foster not paying attention to his pacing and going to the door. 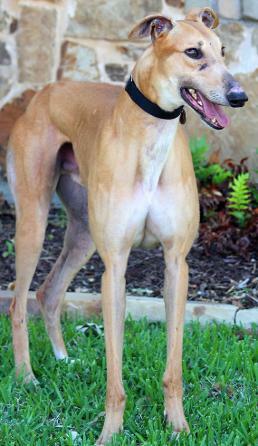 Sandman walks very well on a leash and loves to meet other people – it’s just for the petting. At first small dogs will make him run behind me and peek out to see if it is safe - then warms up quickly and does not chase them or other small critters. Sandman crates very well and when it’s time for him to take a ride he loads and exits well in the vehicle. He lays down even before I have left the garage but does, occasionally, stick his face out of the window to contribute a little of his slobber down the side of the car. This is merely the beginning of “The Sandman” book, and I will leave the pleasure of learning so much more to his forever family. He will teach you as much as you teach him. Come see him; you won’t be disappointed. 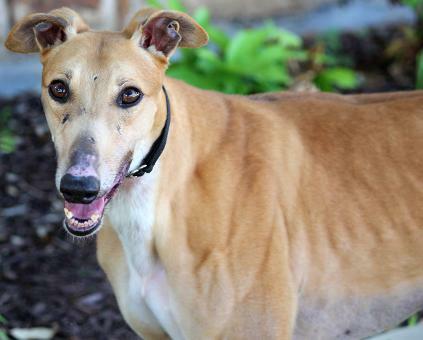 May 4, 2014 update: Sandman came to TAGS for a life of retirement and to find his loving lifetime home.